Pleased to announce two titles receiving top honors at this year’s eFestival of Words Best of the Independent eBook Awards! Boone’s File Book One is Best Thriller, while Sean’s File Book Two was named Best Short Story after public voting. Thanks to Julie Ann Dawson and company at eFest, as well as everyone who took the time to register and vote! You did this! As always, retail links for all my titles are available on the sidebar. Read, Rock, Review, Recruit, and Repeat! In production news, Boone’s third novel, One Last Scent of Jasmine, continues progress in primary editing and remains on schedule for a winter release. Jasmine is nine percent complete in that stage and lookin’ good. 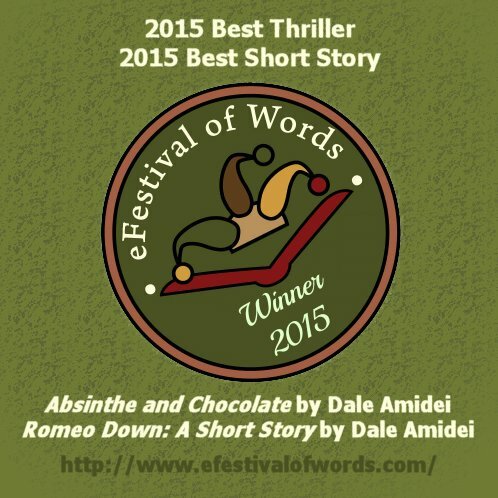 This entry was posted in Uncategorized and tagged Absinthe and Chocolate, Awards, Best Short Story, Best Thriller, Dale Amidei, Daniel Sean Ritter, eFestival of Words Best of the Independent eBook Awards, Julie Ann Dawson, Rebecca Boone Hildebrandt, Romeo Down: A Short Story. Bookmark the permalink.